Leprosy, also known as Hansen’s disease (HD), is a chronic disease of the skin and peripheral nerves. 95% of the world’s population is naturally immune to the disease. Mycobacterium leprae, the causative agent, was first identified under the microscope in 1873, by Dr. Gerhard Hansen, a Norwegian researcher. Norway was the last European country to have a serious problem with Hansen’s disease. The first cases of HD in Louisiana were detected in the 1750s. Left untreated, HD can be progressive, causing permanent damage to the skin, nerves, limbs, and eyes. Contrary to folklore, HD does not cause body parts to fall off, although they can become numb and/or infected as a result of the disease. Skin lesions, with sensory loss, are the primary symptoms of the disease. Without the “gift of pain" sensation, patients continually injure their bodies, causing wounds and infections that can create a natural amputation process to extremities and possible blindness. Eventually this successful treatment changed a patients’ quarantine from a “life-time” to a few voluntary years. Hope for discharge fueled many positive changes. The patients’ advocacy movement gained steam. News of the successful treatment spread around the world. Today, a multi-drug therapy is used to treat the 150-to-200 new cases diagnosed in the US yearly. Louisiana patients are now treated at a Baton Rouge out-patient facility. Make a right onto the oak lined avenue and drive to the front of the Infirmary for Stop 4. Mycobacterium Leprae. Image Courtesy of the National Hansen's Disease Museum, Permanent Collection. Carville, LA. : M. leprae can be identified under the microscope using a skin biopsy and special staining. The "Fite stain" was developed by pathologist Dr. George L. Fite, chief of the Laboratory Branch of the Carville leprosarium, in the 1950's. Dr. Guy Faget. Image Courtesy of the National Hansen's Disease Museum, Permanent Collection. Carville, LA. : Dr. Guy Faget was the Medical Officer in Charge at the National Leprosarium from 1940-1947. Faget discovered the effectiveness of sulphone drugs in leprosy treatment. The new drug regiment was immortalized as the "Miracle at Carville" in a best-seller by patient Betty Martin who was successfully treated and released from the hospital, along with her husband Harry, in the late 1940s. Before and After Sulphone Drug Treatment. Image Courtesy of the National Hansen's Disease Museum, Permanent Collection. Carville, LA. : This series of photographs taken over the course of treatment (L-R) show a female patient's transformation back to health. Current Drug Treatment for Hansen's Disease in the United States. Image Courtesy of the National Hansen's Disease Museum, Permanent Collection. Carville, LA. 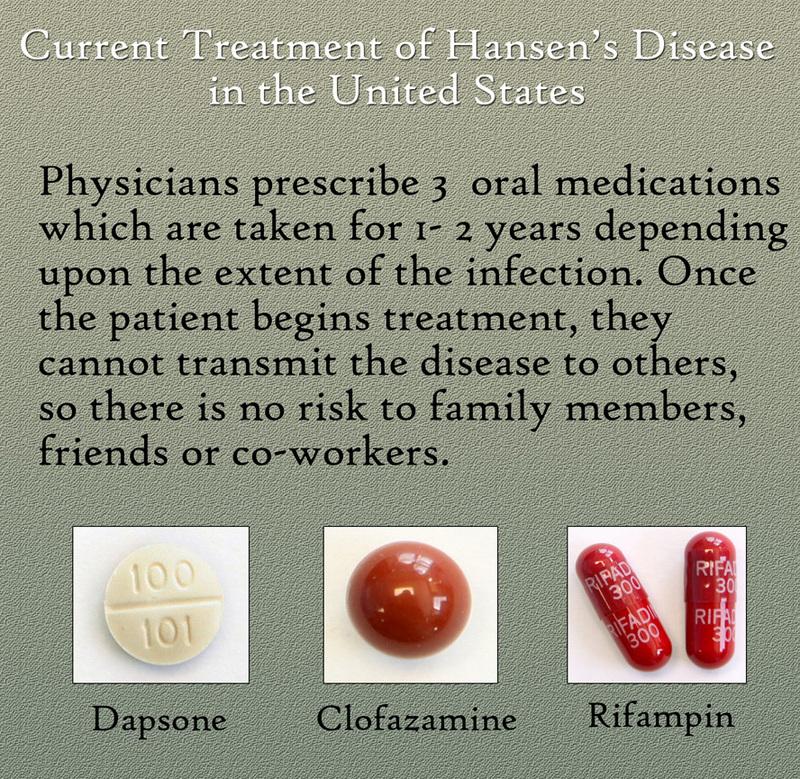 : Today, physicians prescribe 3 oral medications taken for 1-2 years to treat Hansen's Disease. Once the patient begins treatment, they cannot transmit the disease to others. Drugs are available through 12 outpatient clinics in the US and territories. Drugs: Dapsone, Clofazamine, Rifampin. Elizabeth Schexnyder, Curator, National Hansen's Disease Museum, Carville, LA , “Hansen's Disease,” New Orleans Historical, accessed April 24, 2019, https://neworleanshistorical.org/items/show/634.